Jessica Ludders has been named the 2015 North Carolina Virtual Public School Teacher of the Year. NCVPS is proud of her excellence in teaching as well as the leadership she has exhibited during her tenure with NCVPS. Please join us in congratulating her. Each year NCVPS selects one teacher from a group of finalists to represent the school as its Teacher of the Year. All the finalists exemplified to the highest degree their commitment to student success, knowledge and skills as professional educators, and dedication to the NCVPS online program. Jessica Ludders graduated from University of Southern Maine with a bachelor of arts in English. 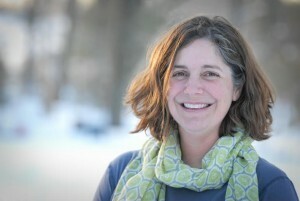 She earned her master’s degree in English from Middlebury College and is currently working on her master’s in instructional technology and school leadership at the University of Maine. Ludders taught one year at Kennett High School in Conway, New Hampshire; two years at The New School in Kennebunk, Maine; and four years at PACE Academy in Carrboro, North Carolina. She taught ten years for Alamance Community College and has taught the past four years online with the University of Maine Augusta. She has taught eight years with NCVPS, where she currently teaches English 2 Honors and journalism. In addition to her teaching duties with NCVPS, Ludders has taken on numerous leadership and support roles. She is the instructional lead in the Teachers in Training program and is the team lead for course revisions. She is also the course lead for English 2. Ludders will now advance to the National Online Teacher of the Year competition where she will represent NCVPS. This was the seventh year for the NCVPS Teacher of the Year award. NCVPS would like to congratulate all of the teachers who were nominated by their peers for the award: Darlene Schaefer (English), Cara Ward (OCS History), Douglas Lloyd (Art), Karen Mach (Credit Recovery English), and Lydia Richmond (Credit Recovery English). The NCVPS staff was incredibly impressed with all six nominees’ presentations, and the staff is proud and grateful to have them as teachers in the NCVPS family. The NCVPS selection process for the Teacher of the Year program is divided into four phases beginning with the call for nominations. From there, nominees participate in a blind selection process that starts with answering a series of initial questions on instructional philosophy and student-centered instruction. The selection committee then narrows the field to six finalists who complete a portfolio of responses and showcase examples of their work that demonstrate their approach to teaching and their beliefs about instruction. The six finalists are then interviewed by the committee before the final selection is made. NC Virtual Public School is the nation’s second largest state-led virtual school with over 52,000 enrollments from all 115 school districts and many charter schools. NCVPS offers over 150 different courses as a supplement to the local high school course catalogue and includes Advanced Placement, Occupational Course of Study, electives, traditional, honors and credit recovery courses. All courses are taught by teachers certified in North Carolina and provide strategies for active student engagement through a variety of technology tools. Teachers are required to make personal contact with students and parents regularly in order to maximize the student-teacher relationship. Courses are free to students who enroll through their local NC high school. NCVPS is available to home school and private school students for a small fee. By virtue of online course delivery, students now have access to rigorous courses and high quality teachers regardless of zip code.